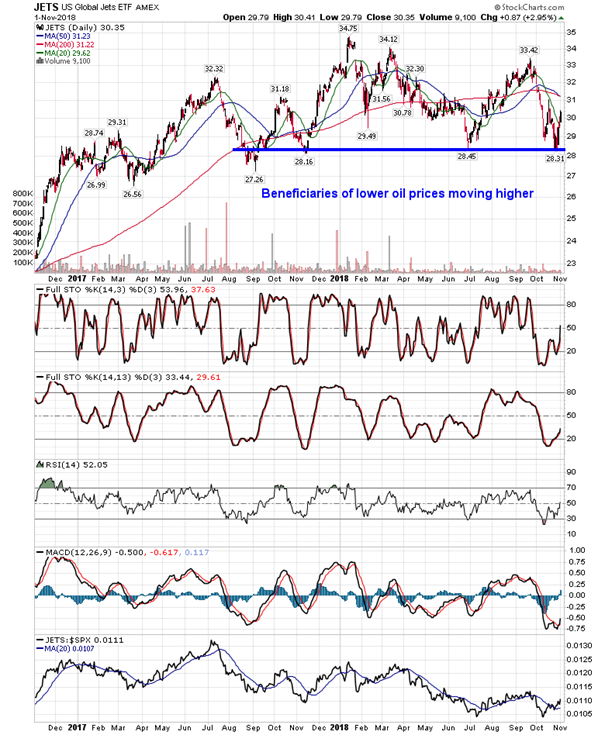 Seasonally favoured sectors benefiting from the breakdown in oil prices. 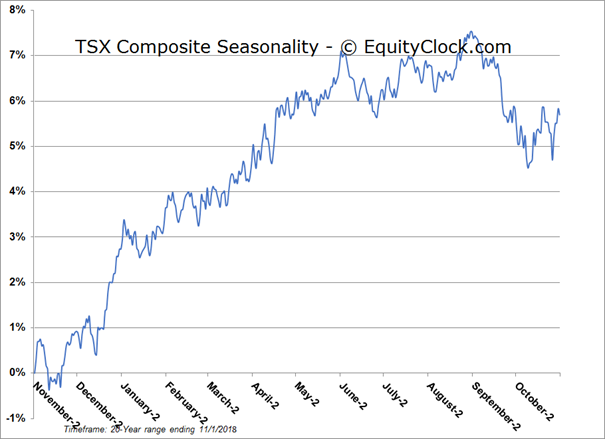 Stocks started the month of November on a positive note as investors added to the cyclical sectors that were beaten down in the month just past. 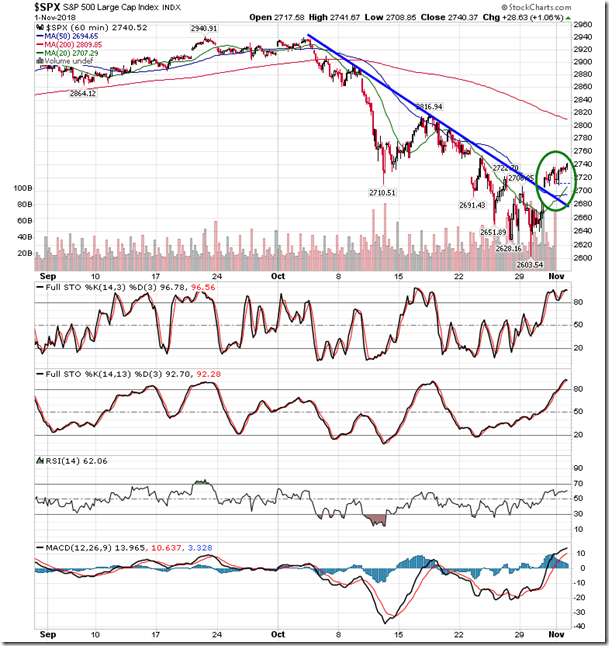 The S&P 500 Index added just over one percent as the market found comfort in the fact that Donald Trump is in communication with Chinese President Xi Jinping regarding trade. 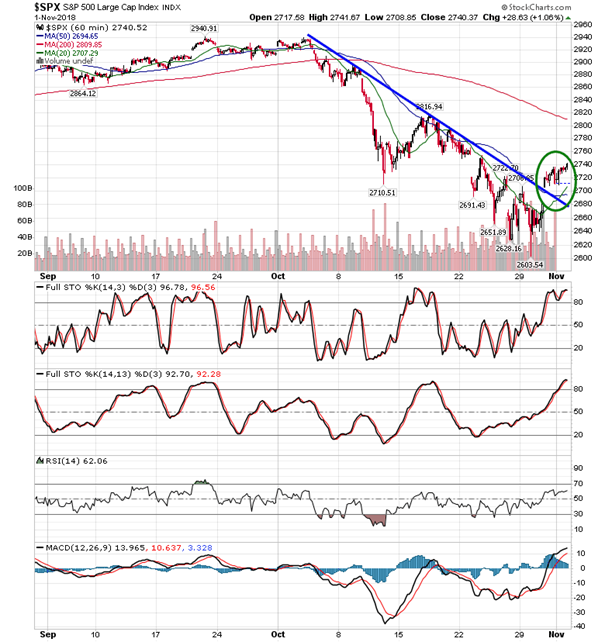 The large-cap index gapped above declining trendline resistance is yesterday’s session, suggesting the conclusion of the sharp path lower that dominated October’s price action. 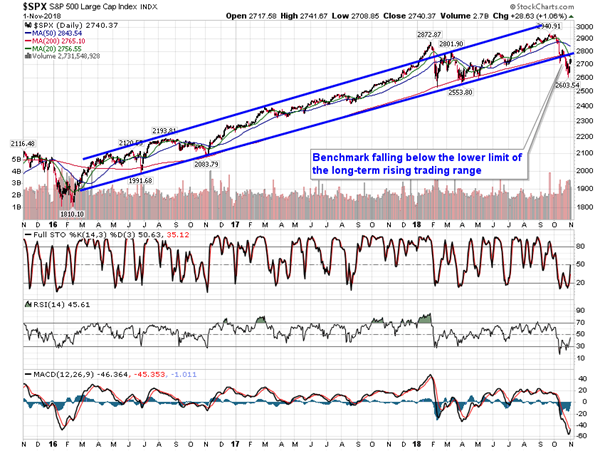 The benchmark is looking a little tired following its three-day rally, but two catalysts could have an immediate influence. Investors will be reacting to Apple earnings during Friday’s session, as well as react to the latest non-farm payroll report in the US. 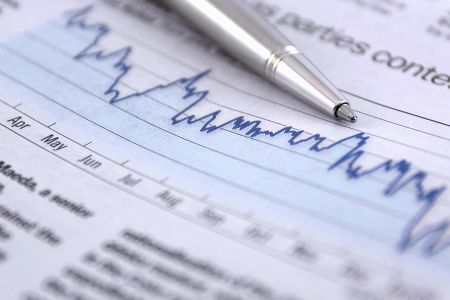 Analysts are expecting payrolls to show an increase of 190,000, which would be a solid improvement from the 134,000 increase reported in the month prior. Before the seasonal adjustments, payrolls increase by 0.5%, on average, in the month of October, which would suggest an actual increase of 748,700. 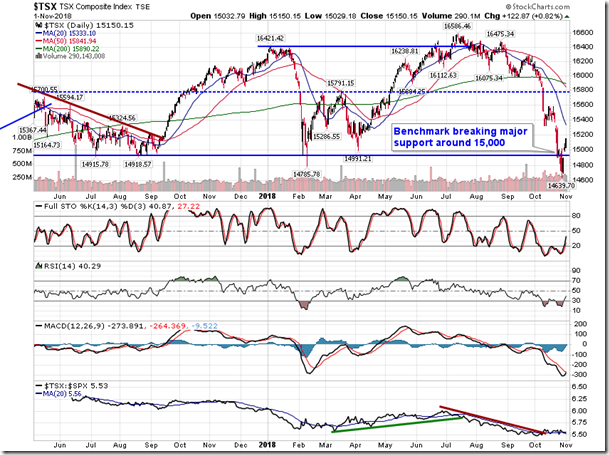 Investors will be particularly interested in the wage numbers, which ran a little hot in the last report. In our monthly outlook that we release to subscribers at the start of the week we showed the correlation of wages with the effective funds rate. Want a copy of our report? 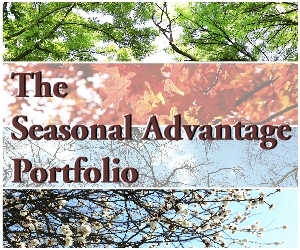 Simply subscribe to either the monthly or yearly option within the seasonal chart database via the following link: https://charts.equityclock.com/subscribe. 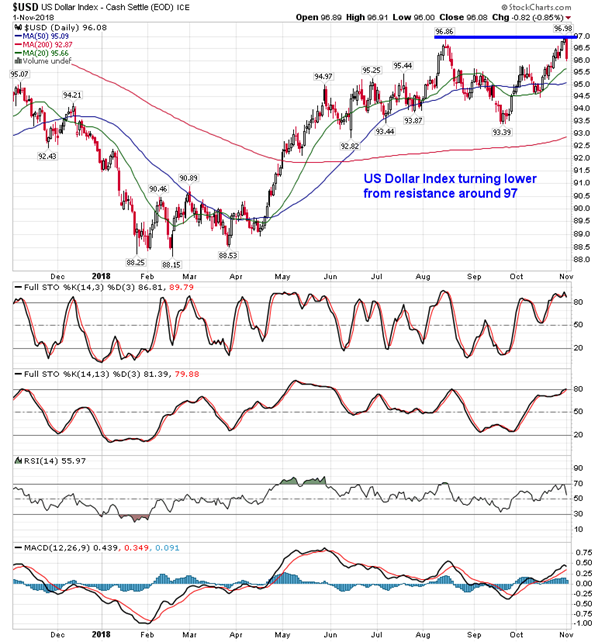 Industrials, materials, and consumer discretionary topped the leaderboard on Thursday as the US dollar moved lower on the day. 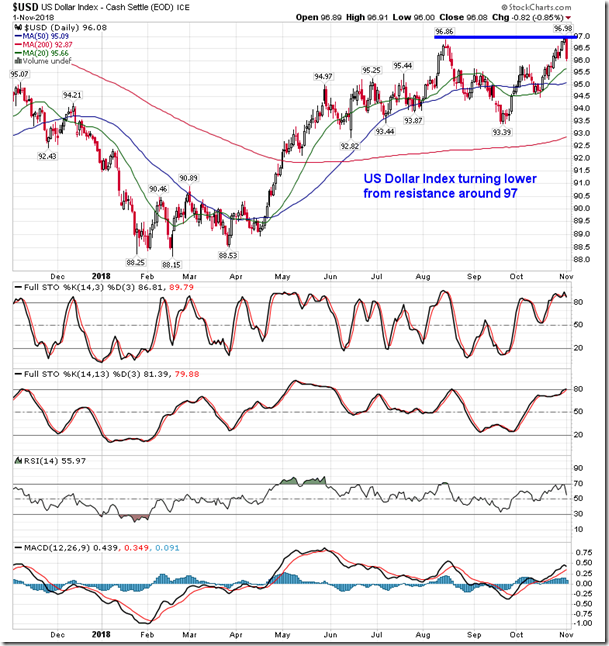 The US Dollar Index gapped down from horizontal resistance close to 97, hinting of the potential of a double top. 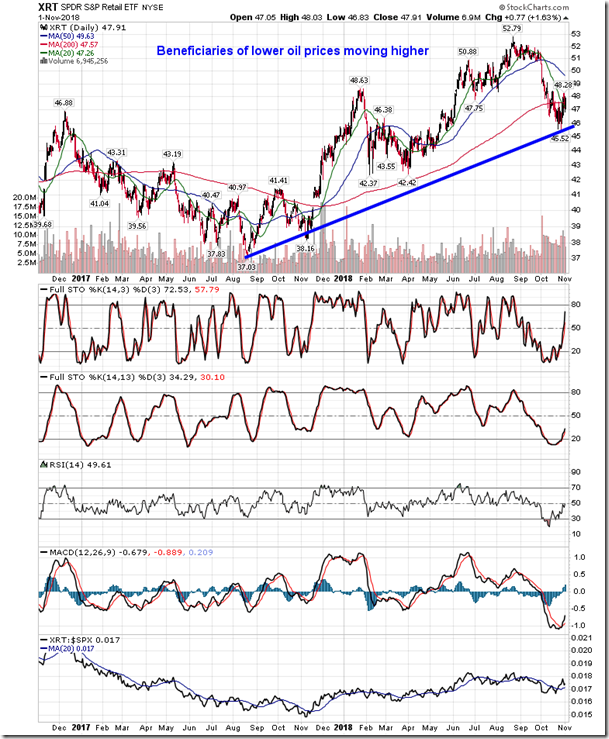 The downfall in the currency gave lift to metal and agriculture commodities, but energy commodities were not as fortunate. 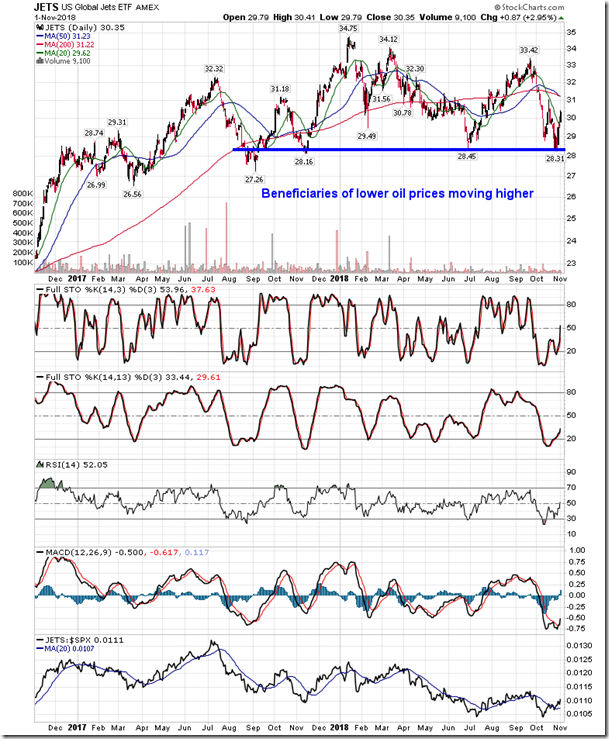 The price of oil plunged by over 2%, continuing to fall below its 200-day moving average. Of course, seasonally this is a weaker time of year for the energy commodity, but the downfall is finally showing positive impacts on industries and sectors that benefit from the lower input cost. 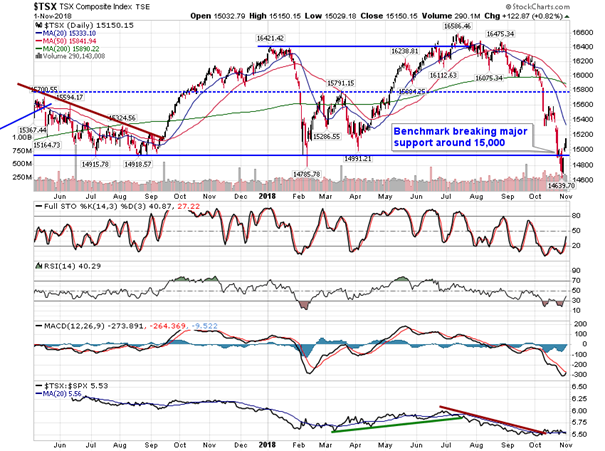 The Airlines ETF (JETS) was up by around 3% on Thursday. 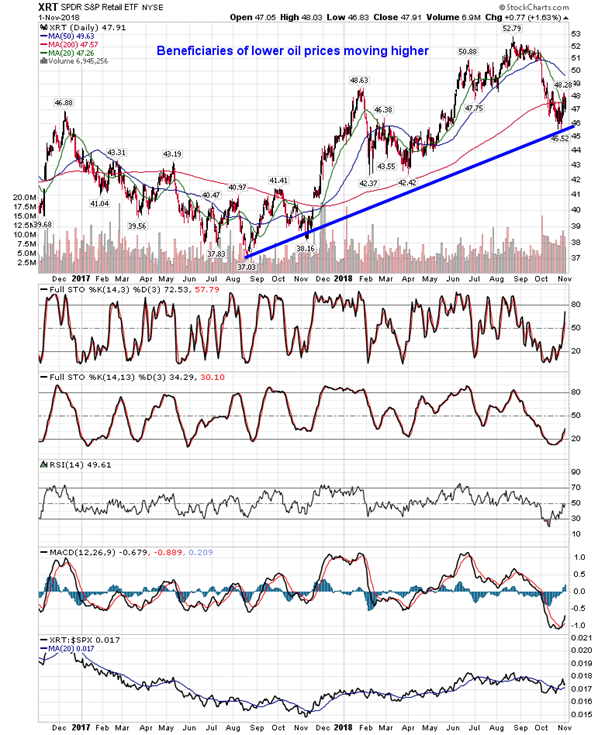 The Retail ETF (XRT) was higher by 1.6% as investors bet on benefits to the consumer in the upcoming holiday shopping season. 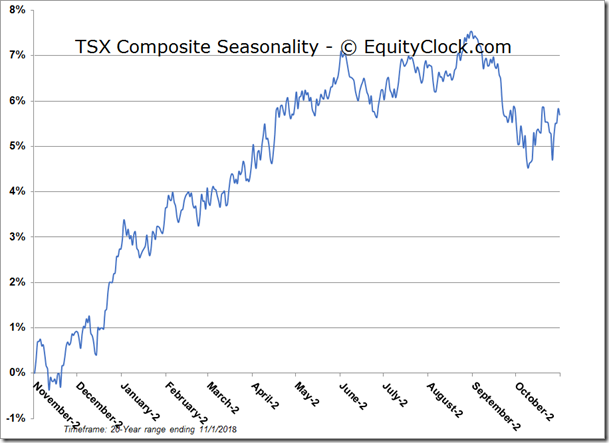 Both industries tend to rise through to the start of December, just as the period of seasonal weakness for the energy commodity comes to an end. 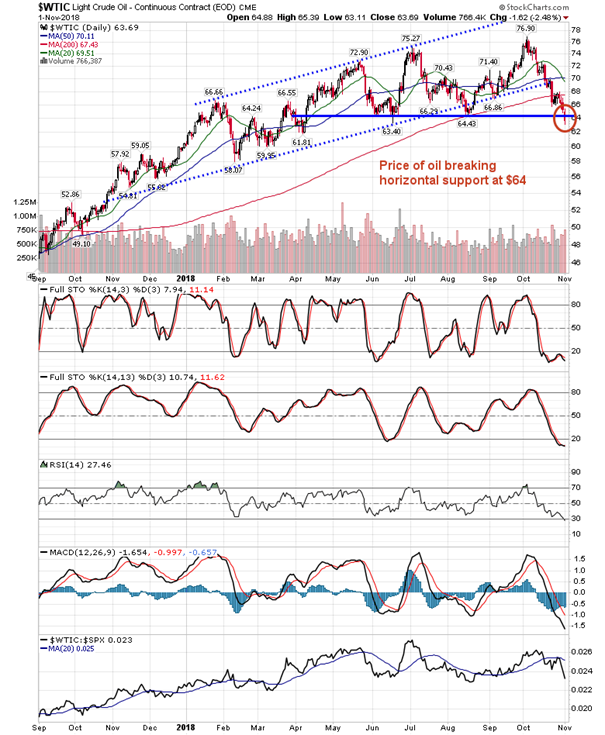 The price of oil is presently cracking horizontal support around $64, which could “fuel” further downside in the commodity and see further upside in the beneficiaries of lower energy commodity prices. 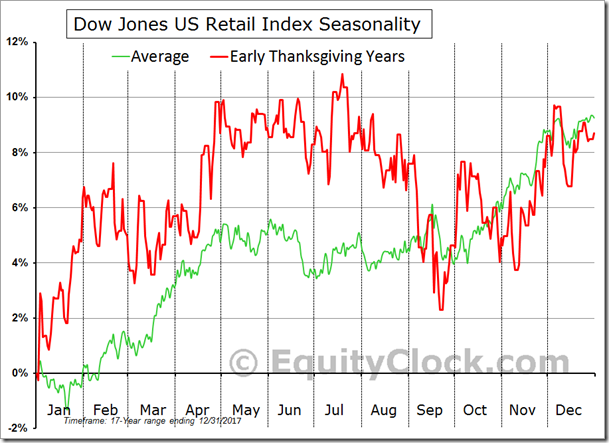 Retail stocks tend to be one of the stronger segments of the market in the month of November as investors bet on the strength of the holiday shopping season. 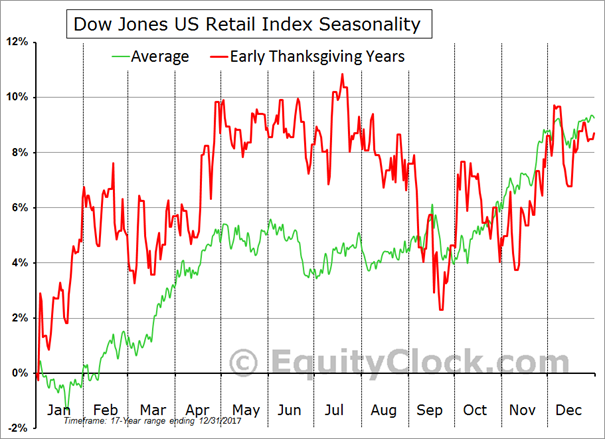 A recent analyst comment suggested that retail sales could get a boost this year from the earlier than average Thanksgiving holiday in the US, allowing consumers more runway to complete their shopping ahead of Christmas. Thanksgiving in the US falls on November 22nd this year, which is the earliest possible date that the holiday could occur. 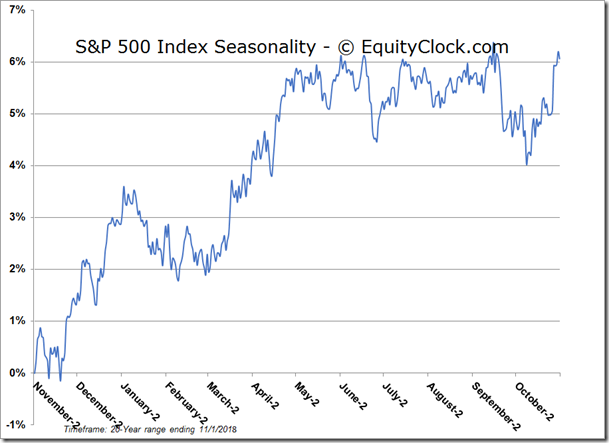 But history suggests that the early Thanksgiving might not provide the big boost to results that you might expect by the greater number of shopping days. Looking at data dating back to the mid-1990’s, there have been three years with the early thanksgiving date of November 22nd: 2012, 2007, and 2001. 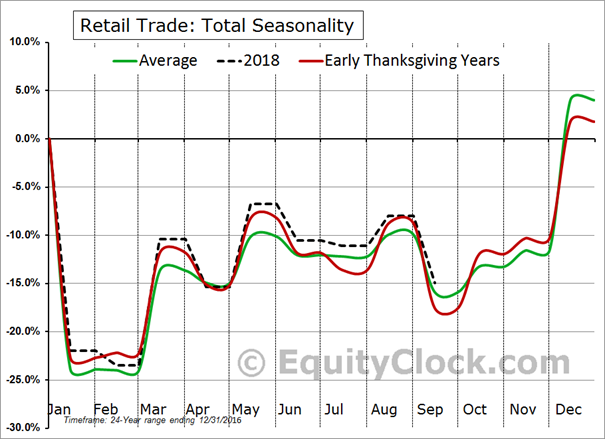 Total retail trade during the holiday season of these years was below average, causing the calendar year increase to lag the historical norm. The calendar year increase in sales in each of the early thanksgiving years was less than half of the average increase in any given year. Keep in mind, though, that the years that we are referring had tough economic conditions that would have had a negative influence. 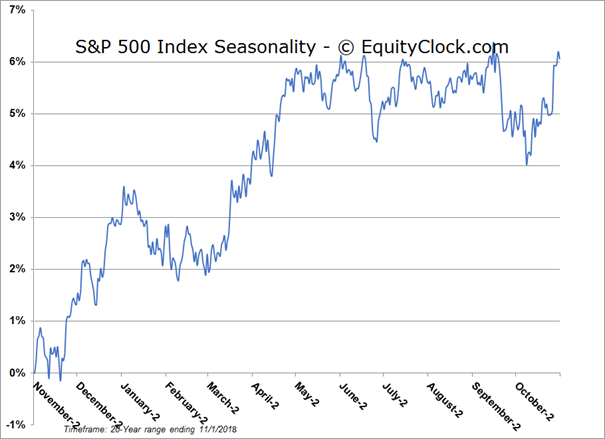 The average performance of the stocks showed little deviation from seasonal norms when the Thanksgiving holiday fell on the early date. 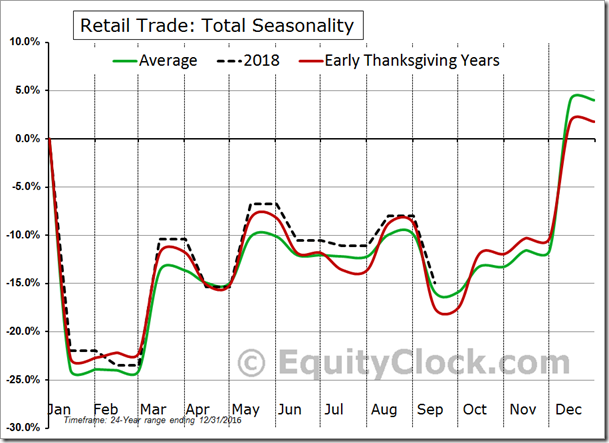 We’ve created a number of charts in our study showing the performance in the various industry segments during early Thanksgiving years and uploaded them to the seasonal chart database. Members can login to view the study. Not a member yet? 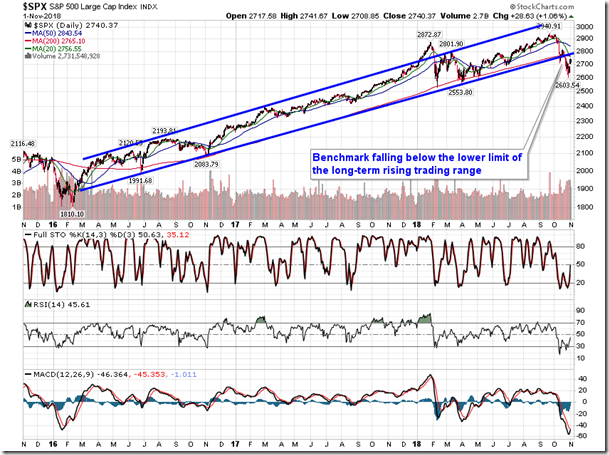 Simply subscribe to either the monthly or yearly option via the following link to gain access: https://charts.equityclock.com/subscribe. 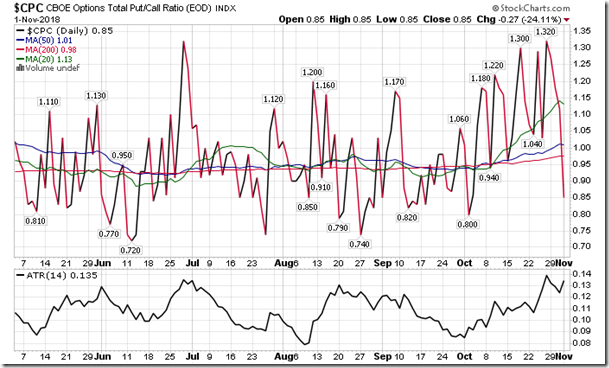 Sentiment on Thursday, as gauged by the put-call ratio, ended bullish at 0.85. 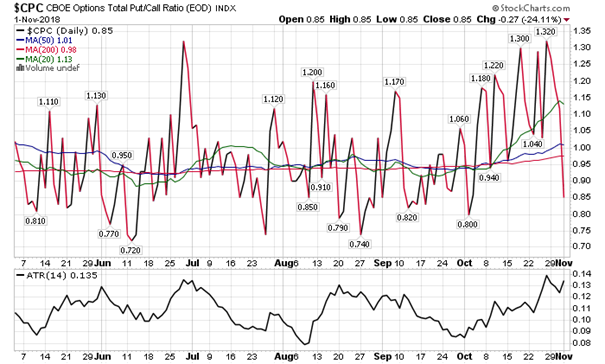 This is the first bullish reading we have seen since early October, just before the crash that sent major benchmarks into correction territory in the month.